I’d say, as a whole, the EOS family is very generous of spirit – we give time to causes and organizations that are important to us. We do it throughout the year, without any desire for attention and not to see our names on a list. It was how I was raised, so as my kids grew up, I made it a priority to teach them how important it is to give time. At some point though, the kids have to decide as adults if giving back is a natural part of their being when I’m not there to say let’s go. Enter Thanksgiving 2015. We’re a rag tag group this year, most heading elsewhere with significant others or to be with aunts in RI who actually still COOK for Thanksgiving (I do not). We will have gathered en masse just three days before Thanksgiving in NYC to celebrate my mother’s birthday so going separate ways for Thanksgiving itself is not foreign. With one child in the food service industry who opts to work on Thanksgiving so she can get Christmas off, we let Thanksgiving kinda slide as a gathering time in favor of Christmas. Shall we work some shifts at Grace Church Soup Kitchen or make reservations at either the Inn at Pound Ridge or the new iteration of the Bedford Post, Campagna? Sure they’d pick volunteering, I was instead met with this………. One outright said No to volunteering (that day). The other said can’t we do both? So I’m at a crossroads – I say the right thing to do is work all day at the soup kitchen but if the others don’t want to, then what good is it to force them? None that I see. Nothing is worse than making someone feel guilty that they aren’t doing what you expect of them when what you expect might only be right for you. Does that make any sense? We’re back at square one, undecided. This does look mighty fine…. It would be one thing if we never volunteered other times during the year, then giving one day at Thanksgiving is like saying you go to church when you only attend services on Christmas and Easter. I don’t want to be a hypocrite here and get the kids to give back for the sake of giving back. Or do I? Worthy conversation. I expect my children to volunteer but neither comes at it willingly. They push back but they are young enough yet that I insist. 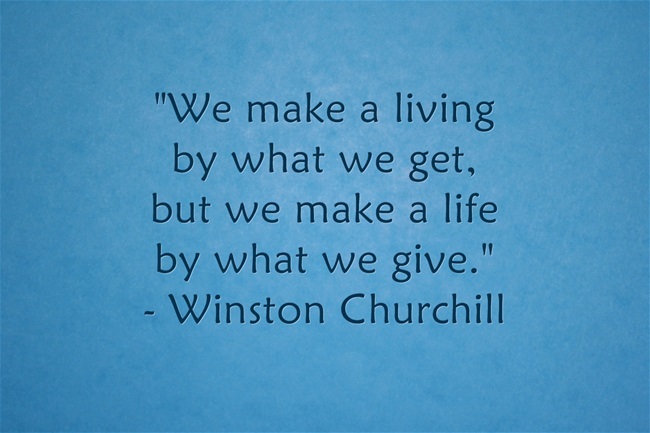 I’m not sure what good I am doing trying to instill the moral responsibility of giving back if its not in their hearts. 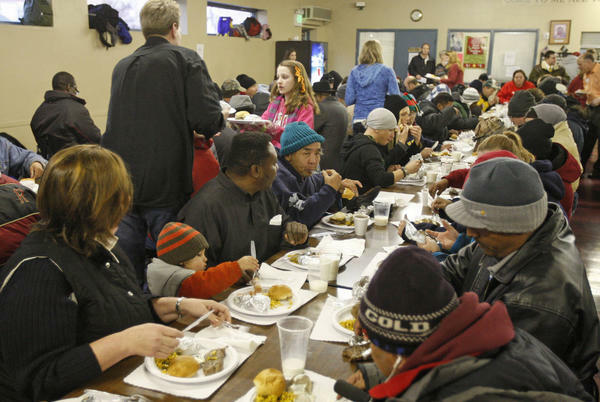 I’d say go out to dinner, sit back and enjoy, then volunteer at a time when the church isn’t getting a million phone calls from do-gooders to help on Thanksgiving Day, then disappear for another year. Why don’t you cook at Thanksgiving? Because we’ve been going into in the city for the last few years and picking a good restaurant to do the cooking for us. I do love to cook on Christmas Eve and Christmas Day. Catherine makes the best point here. 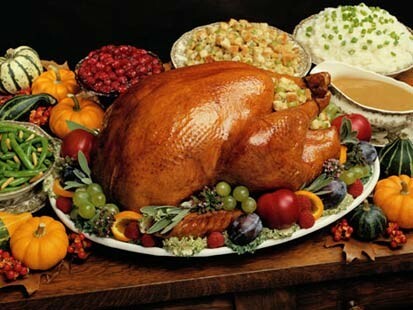 If you are a family that gives back regularly throughout the year, take Thanksgiving to enjoy a meal out. She’s right that the majority of people who call shelters to biluntier on Thanksgiving do it because they feel guilty they don’t do it any other time. Campagna! Had dinner there two weeks ago and thought it was excellent. I’m with the others, enjoy Thanksgiving dining out and volunteer as you normally do the rest of the year. You could look at it this way: By dining out and supporting the restaurant, chefs, servers, etc., you are also doing something good (kind of the Daddy Warbucks thought process, but, that’s how we do it until “we feel the Bern” after 2017). I suppose, but I know how hard it is for those servers to be there on a day they’d really rather be home with family so I mostly feel guilty, not supportive. True, but, if you talk to them, they make internal adjustments (trading days off, etc.) so that the more family-oriented ones do get the time off and everybody still goes home with a paycheck. Tip big to assuage that guilt! Very true. As I’ve said here many times, one of our brood manages a restaurant in the city. She knows full well that a happy staff is a staff who among themselves can swap days to take a day off. Many are willing to work a double shift too, in order to have a day off another time. Balancing act. Here’s a neat story related to your Bridge of Spies viewing. Cool cool story. I did not see that. Coinky-dinky to that, in a recent sleep outage, I had Buzzr channel on with an old To Tell The Truth. Three women pretending to be Aline Mosby, a UPI bureau writer stationed in Moscow during Gary Powers imprisonment. ← I Can See Myself! The Eagles Have Landed. Oops, Not so Fast. As if Twitter isn’t Bizarre enough…. It’s On. Oh Boy, Is It Ever! Free Inside a box of CrackerJack?